The arrival of your new baby boy is a memory to cherish a life time. Remember this special occasion with our Embroidered Blue Bib Teddy Bear. This detachable bib with blue trim is featured on our exclusive Sherman Teddy Bear! Sherman was established in 2012 and has become one of the sweetest teddy bears around! He has an irresistible look on his face along with a super soft feel. He has contrasting fur on the inside of his ears and his snout. Sherman measures about 11” and makes a wonderful gift for your new baby boy. Free Gift Wrapping and a Free Gift Card are included to create a thoughtful presentation. 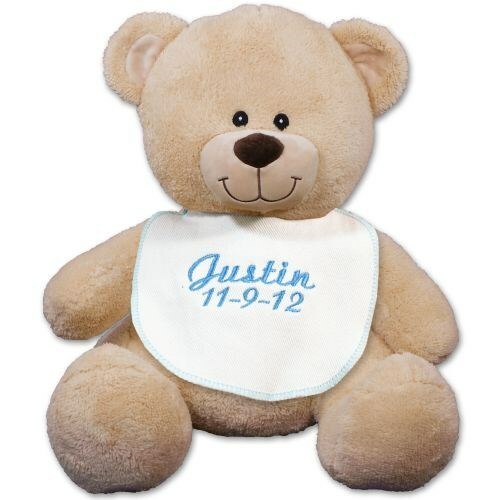 Additional Details Create a treasured keepsake your baby will enjoy for years and years when you shop our collection of New Baby Boy Plush Animals. Our cuddly bears and plush animals are sure to become an instant favorite. He will also enjoy our New Baby Boy Blue Teddy Bear as well.